The Boy in the Box: Master Melville's Medicine Show by Cary Fagan. Review: "But I'm not dead!" So says Sullivan Mintz, the protagonist in The Boy in the Box: Master Melville's Medicine Show, the first book in a series by Cary Fagan. The book is about an eleven-year-old boy named Sullivan Mintz whose family owns the Stardust Home for Old People. Sullivan takes up juggling as a hobby after his best friend Manny, who is eighty-one years old, suggests it. In the beginning of the story, Sullivan and his sister, Jinny, go to see a medicine show but Sullivan ends up getting kidnapped by Master Melville, the show's leader. When Sullivan asks Melville to let him go home, Melville tells him it's too late and shows him an article that says he drowned. Although everyone else in town thinks he is dead, Manny and Jinny go looking for Sullivan. Meanwhile, Sullivan meets new people who belong to the medicine show and develops a rivalry with Frederick, who is a magician. On the other had, Sullivan forms alliances with Clarence and Esmeralda. Will Sullivan accept his fate with the medicine show or will he try to escape? You'll have to read to find out. In my opinion, The Boy in the Box: Master Melville's Medicine Show is written for fourth through seventh graders. I think that all the characters in the book were round, the changed and developed. Sullivan, Manny, Jinny, Clarence, Sullivan's friend Norville, and Esmeralda are also likeable. I feel there are not many flat characters. Also, I like how the author breaks each chapter into smaller sections, so you don't have to read an entire chapter about the characters. I think the plot was well developed as it is adventurous, fast-paced, and sometimes suspenseful. The book ends with a cliffhanger, and this will leave you wanting to read the second book. All in all, The Boy in the Box is a great book, and I would give it four out of five stars. Review written by Luke (6th grade student). 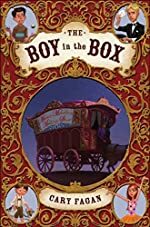 We would like to thank Houghton Mifflin Harcourt for providing a copy of The Boy in the Box: Master Melville's Medicine Show for this review. Have you read The Boy in the Box: Master Melville's Medicine Show? How would you rate it?